We offer carbonated spring water to all the customers without any extra charge. Did you know that carbonated spring water shampoo is a more effective way in of getting rid of grime and dirt from the pores of your head than regular shampoo? This also helps to reduce hair damage and generates healthier hair. Here in Singapore, ultraviolet rays are strong so is the water when compared to water in Japan which is more alkaline and contains fluoride. Moreover, the temperature difference between indoors and outdoors is more than 10°C, and humidity is around the 70% range. All these factors contribute to hair damage. 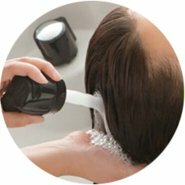 For those who have noticed hair loss, hair damage, and dry scalp since coming to Singapore, the probable causes are ultraviolet rays and water. At COVO, we recondition the cuticles to reduce hair damage by using carbonated spring water. Your hair will be silky smooth as we rid your hair of dirt and sebum, and improve the blood circulation of your scalp. Furthermore, you can expect positive results when you set, colour and even perm your hair. You will be able to feel and see highly effective results with our carbonated foam head spa. We also have carbonated products for sale in our salon so you will be able to achieve similar results at home. Carbonated foam does not contain anything unnecessary and only contains ultra-high concentration of carbon dioxide, so it can be used for both your hair and skin. It recognizably promotes blood circulation when used on your skin. It also helps your skin return to its original 28-day turnover cycle, thus removing dullness of the skin and has a lifting effect.